Editor's Note, August 10, 2 p.m. ET: Apple was inaccurately named in a patent application for a vehicle-related invention designed for "war situations," as CNNMoney reported on Tuesday. The filing attorney of the actual owner, BAE Systems Hägglunds Aktiebolag, made a "typographical error" when submitting the application. The law firm responsible for the filing, Morrison & Foerster, issued a correction to the U.S. Patent and Trademark Office after the patent was issued Tuesday. Apple just got a very unusual patent. It's for a "steering device" on large vehicles with pivot joints to help them turn. Think of accordion buses or the way semi-trucks work. 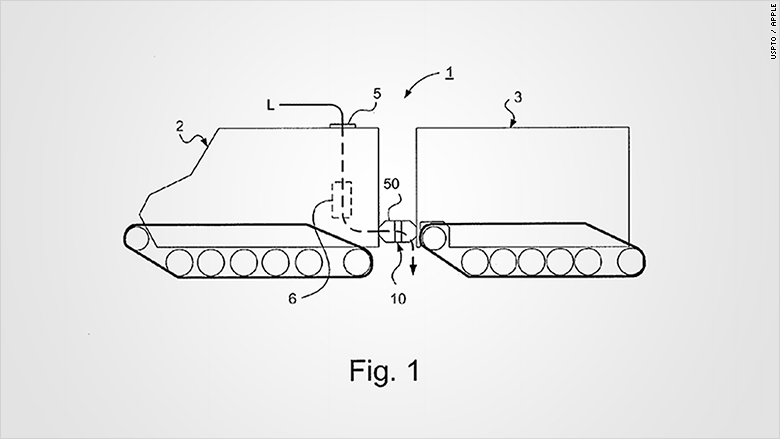 But according to the approved patent filing published Tuesday, the invention could be intended for vehicles in a "war situation." While the U.S. Patent and Trademark Office granted Apple the patent, the original application was approved last year for BAE Systems Hägglunds Aktiebolag, a Swedish subsidiary of the huge global defense company. The invention is designed to better connect and steer two compartments of a vehicle inside a special "ballistic protection" enclosure. Russell Phillips, an author of military tech books, believes the proposed tech is designed to improve something like the Bandvagn 202, an all-terrain truck used by the Swedish army. The Bv 202 is actually two different vehicles, according to Phillips, and is used more for logistics transportation than combat. The new device would help steer the front and back units simultaneously. If the vehicle is turning left, for example, then the invention would steer the back wheels to the right to make the turn more easily. It's unclear why Apple would want a device that seems to serve such a specific military purpose. But many technologies were designed first for defense departments and later adapted for civilian use. GPS and autopilot navigation features are two big examples. This was one of 80 patents that Apple was granted Tuesday, according to PatentlyApple. BAE Systems and Apple did not respond to request for comment.